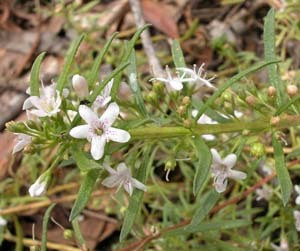 Myoporum parvifolium is a rare, low growing native shrub found only in a few places on Flinders Island (although it is more common on mainland Australia). The somewhat succulent leaves are much narrower (about 2-5 mm wide) than those of its relative, M. insulare. The flowers are two lipped (like those of the mint family, Lamiaceae).